DSM Console Access Servers help to minimize network downtime by providing IT personnel with secure, reliable Out-of-Band Rescue™ access to console port functions on remote network devices. If you’ve got a network emergency, whether in the middle of the night or the middle of a holiday weekend, you need a console access server that works without fail to provide quick, reliable access to your servers, routers, switches and other network devices. Wouldn't it be nice if you could just reach out across the miles, and connect to a console port on a troublesome router or conflicted server, without a lengthy road trip to a remote network installation? Relax. That's exactly what you can do if your network includes a WTI Console Access Server. Our Console Access Servers provide you with out of band management capabilities, that allow network administrators to establish secure, reliable communication with console ports on remote network equipment; eliminating the need for that long drive to a remote network equipment cabinet. WTI offers a wide range of Console Server products to fit the needs of most remote console management applications. In addition to our line of dedicated Console Server Products, we also offer Console Access Server + Power Control Hybrid products, which provide both remote console port access and remote control of power switching and reboot functions. WTI Console Access Server products allow network administrators to employ managed MIB objects to display unit status, define configuration parameters and create and edit user accounts. When user-defined event alarms are configured and enabled, WTI Console Access Server products can also send SNMP traps to provide notification when specific alarm events are detected. WTI Console Access Server products feature SSHv2 encryption and IP address filtering to prevent unauthorized users from gaining access to sensitive command functions. In addition, WTI console access servers also include a multi-level user directory, which allows administrators to assign each user account to one of four different levels of command access. 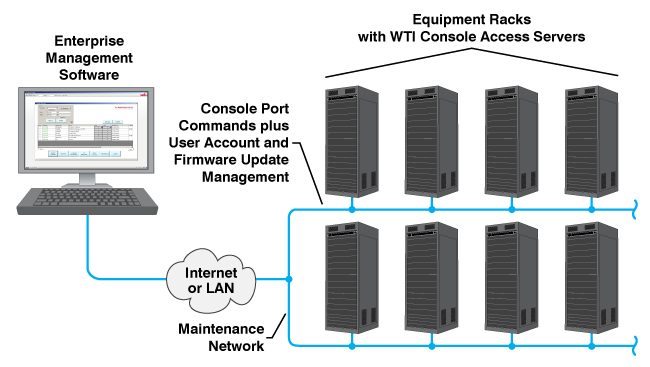 This user directory provides an ideal tool for co-location applications; account privileges can be set to allow users to connect to serial ports on the switch, while preventing access to higher level configuration functions. In order to allow convenient out of band communication with other devices on your network, WTI Console Access Server products include the ability to allow users to initiate outbound SSH and Telnet connections from any free RS232 serial port on the Console Access Server unit. Outbound SSH/Telnet capabilities can be individually enabled or disabled for each user account. When outbound SSH/Telnet is enabled for a user account, this allows the user to connect to other network devices via TCP/IP. WTI Console Access Servers include a formidable array of alarm features that allow monitoring of unit temperature, ping response, power conditions, invalid access attempts and other factors. When the console access server determines that conditions have exceeded user-defined thresholds, the console access server can notify the appropriate personnel via SNMP trap, text message, email or Syslog, allowing quick response to critical conditions, and also providing administrators with the ability to address potential problems before they interrupt user access to critical network devices. Each individual serial port on the WTI Console Access Server can be set to a separate baud rate, handshake mode, port mode, command echo, inactivity timeout value and break character response. The port configuration menu also allows administrators to assign a unique port name as well as enable and select separate direct connect parameters, Syslog functions, buffer functions and other parameters for each port. 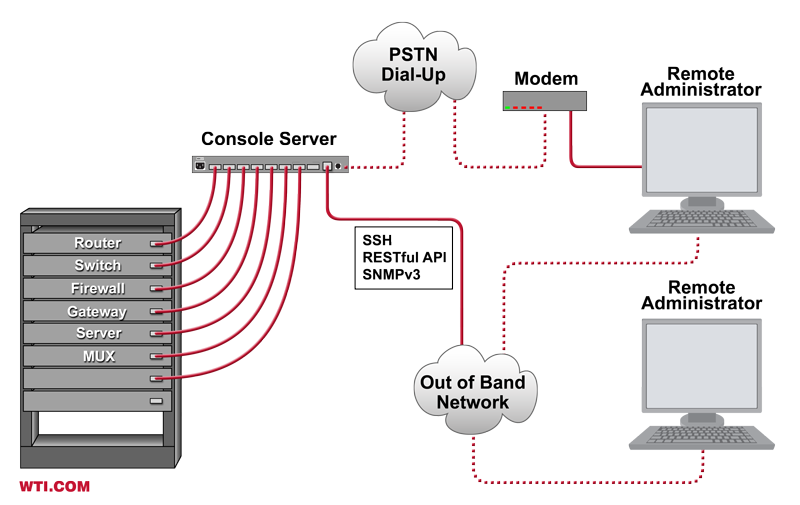 Full matrix connectivity allows any two serial ports on the switch to be easily connected, even when port parameters and communication settings for the two ports do not match. Port connections are established using simple line commands that specify the desired serial ports by number, name or port group. When enabled, direct connections can also be established via TCP port assignments. WTI Console Access Servers provide the perfect tool for applications that require the collection of error and status messages from attached devices. Each individual serial port on the WTI Console Access Server can be set to Buffer Mode, which allows the port to capture any data that the attached device sends out via its serial console port. Collected error messages, status messages and other data can be stored in the buffer for each Console Access Server serial port, and then retrieved later if the data is needed for diagnostic purposes in the event that a device malfunctions. If desired, each message or data record can also be sent to network administrators via Syslog or SNMP trap to allow real-time monitoring of errors and other events. WTI Console Access Server products include high temperature and low temperature alarms to help network administrators to keep track of rack temperatures and react quickly when temperatures rise too high or fall too low. The temperature alarms continuously monitor rack temperature, and promptly notify administrators when ambient temperatures either climb above or drop below user-defined temperature limits. When excessively high or low temperatures are detected, the console access server can immediately notify the appropriate personnel via SNMP trap, email, text message or SYSLOG message. If desired, the console access server can also send additional notification when temperatures return to acceptable levels. The complicated task of managing user port access privileges and command access privileges is a breeze with a WTI Console Access Server. A multi-level user account directory takes the confusion out of account management, by providing network administrators with a user-friendly interface that can be employed to add users, remove users and set command and port access rights for each individual user account. The user account directory provides a powerful tool for editing access rights and port rights to fit the needs of each individual user, as well as a convenient means to prevent users from accessing commands, functions and ports that don’t apply to their job function. Each user account can be designated to one of four different security levels, access rights for each serial port can be enabled or disabled, outbound SSH/Telnet capability can be enabled or disabled and parameters for modem communication can also be defined and regulated. In order to prepare for the upcoming switchover to IPv6 protocol, all WTI Console Access Servers now provide full support for both IPv4 and IPv6 (the intended successor to IPv4.) This helps to ensure that WTI Console Access Servers purchased today will be fully compatible with the planned IPv6 internet environment, and will not be rendered obsolete when the IPv6 protocol eventually becomes the new worldwide standard for network communications. All WTI console access servers include WTI’s convenient Enterprise Management Software, which drastically simplifies the task of managing multiple console access servers spread throughout your network infrastructure. The WMU Enterprise Management Software provides a centralized command interface that allows administrators to easily manage, label and control multiple WTI console access servers in large network applications, reducing the time required to access console port command functions on connected devices. Once installed on your PC or laptop, the Enterprise Management Software can search a user-defined IP address range on your network and discover all compatible WTI devices within the range. Discovered devices are then added to the Enterprise Management Software’s inventory, allowing administrators to assign a descriptive tag to each console access server in order to denote the location or function of the device. In addition to providing a centralized interface for remote console access functions, the Enterprise Management Software can also be used to control firmware updates for WTI products and edit and manage user accounts at individual or multiple WTI devices.